Picturesque brand 4 bedroom Villa Marmuertowith private pool in Ovacik with a beautiful panoramic forest and mountain view. Nice well groomed garden. The villa has very luxury decoration inside and outside. You will have a fabulous at this luxury villa, set in a very tranquil setting. You can relax in this very beautiful location. You get the feel at country side. This is really good choose, If you stress from city center noises. But still very close to all amenities, its close to Oludeniz and Hisaronu with their entertainment and night life and to Fethiye center. Luxurious and beautifully furnished to a very high standard and with all the modern conveniences that you would expect from a 5 star resort. 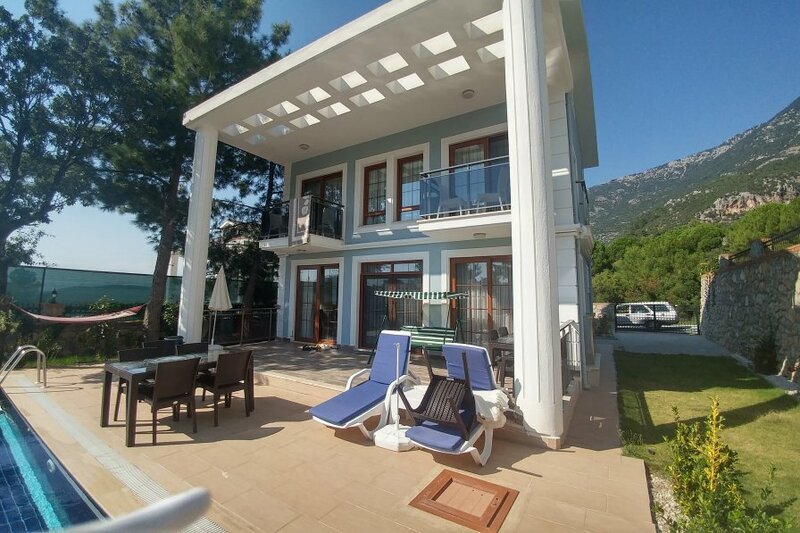 This charming and spacious air-conditioned triplex four bedroom detached villa has wonderful scenery views overlooking to the Hisaronu and the majestic Babadag Mountains. It features a contemporary large open-plan lounge/dining area that leads out to the pool, fully equipped large gourmet kitchen with centre work island, four bedrooms, two shared bathrooms, private swimming pool with plenty of space to relax and sunbathe, well manicured landscape garden and secured parking. The world famous Oludeniz Beach is 5 minutes drive away from the villa, and 10 minutes walk away from the Hisaronu village where you can enjoy an abundance of shops, restaurants, pubs and nightlife entertainments. 1000 TL Deposit is obligatory.